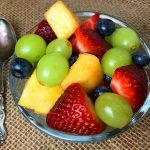 This fruit salad recipe combines the flavors of fresh pineapple, blueberries, strawberries and green grapes for a summer taste explosion. There’s nothing quite like coming home from the farmer’s market with a bag of these fresh delights and creating a carnival of flavors that’s refreshing, healthy and filling. Summer is the time of year when fresh produce markets, farmers markets and grocery stores become packed with some of our favorite fruits. On a recent trip to my local produce market, I came away with a pineapple for 98 cents, strawberries for 39 cents, a huge bag of grapes for a couple of bucks and a container of blueberries for 2 bucks. Ten minutes after I got home they were washed, sliced up and in a huge container in my refrigerator, waiting to be enjoyed for the next couple of days. Well, needless to say, this fruit salad didn’t last a couple of days, by the following afternoon it was gone – the perfect healthy refresher on these early summer days. This combination of fruits is my favorite. All the flavors balance out and you can really feel the fresh burst of flavors in each bite. And here’s the thing, if you happen to get a particular fruit that’s not quite as sweet as usual (it happens all the time), the flavors of these fruits will come together to help each other out. After a couple of hours in the fridge, they’re ready to please the taste buds and the soul. 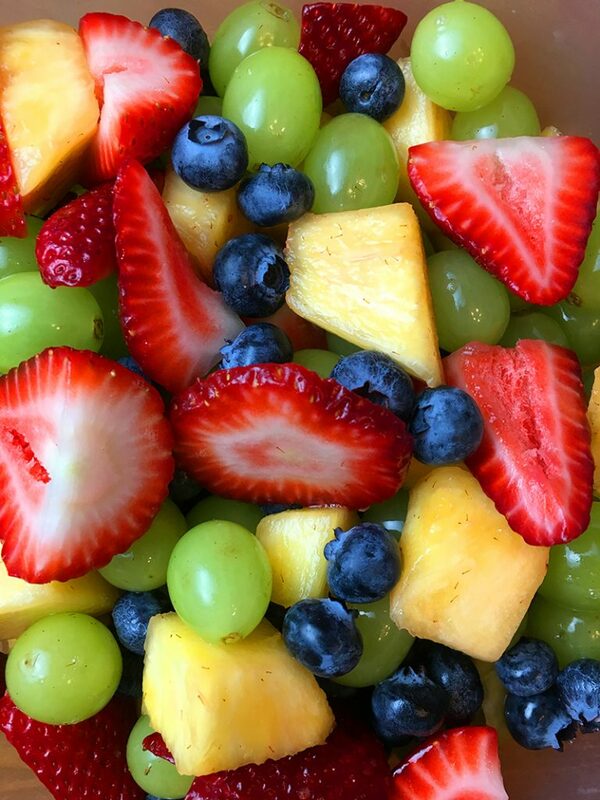 There’s really no right or wrong combination when it comes to fruit salads, but I find this mix to be the best. There’s also no right or wrong with the ratio of fruits, but I find 1 pineapple, 2 cups of grapes, 2 cups of strawberries and 1 cup of blueberries is the ideal mix. in a large Tupperware container, add all fruit, mix well, cover and refrigerate for 2 hours before serving.